Here's a nice counterbalance for our previous report on Carnotaurus's wimpy arms - it turns out any shortcomings in its arms were more than made up for with its super-strong tail, which made it one of the fastest hunters around. Native to South America in the Jurassic and Cretaceous periods, Carnotaurus was a fearsome predator that measured around twenty-five feet long. Its arms were more or less vestigial, but its razor-sharp teeth more than compensated for this deficiency. And now research from University of Alberta paleontologist Scott Persons has revealed another piece of the puzzle: Carnotaurus had one ridiculously strong tail. Tail bone fossils reveal that a particular muscle known as the caudofemoralis was attached by a tendon to the upper leg bones. When Carnotaurus moved its tail, it flexed this muscle, and in turn pulled back on the legs. This gave them a much stronger, faster step than would otherwise have been possible, giving Carnotautus unnaturally fearsome strides. Persons' examination of the tail of Carnotaurus showed that along its length were pairs of tall rib-like bones that interlocked with the next pair in line. Using 3-D computer models, Persons recreated the tail muscles of Carnotaurus. He found that the unusual tail ribs supported a huge caudofemoralis muscle. The interlocked bone structure along the dinosaur's tail did present one drawback: the tail was rigid, making it difficult for the hunter to make quick, fluid turns. Persons says that what Carnotaurus gave up in maneuverability, it made up for in straight ahead speed. 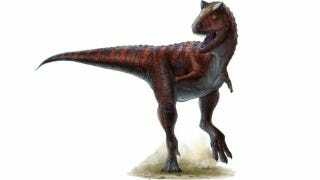 For its size, Carnotaurus had the largest caudofemoralis muscle of any known animal, living or extinct. Via the University of Alberta.